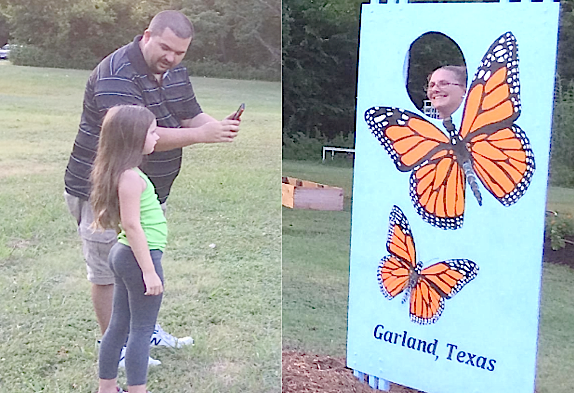 And the Garland Texas 2017 Monarch Stories Begin! IT IS OFFICIAL! MONARCHS ARE MATING IN NORTH TEXAS EVEN BEFORE JULY 27, 2017! Kala sent me an email after I sent her my recent post about the Monarch face board down at the garden. Kala told me the Monarchs have already arrived. 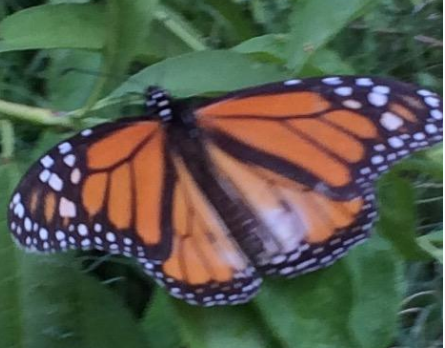 It was funny because today at different times in the Garden both Jane and I thought we sighted a Monarch flitting around, but neither of us could get close enough to confirm it. Kala, however, as you can see from the photo above, has the unequivocal proof of their presence in our area. Kala found a photo of the mother of the two caterpillars above. "Momma" - Female butterfly - Photo by Kala King. Taken through her window on July 14, 2017 - Garland, Texas. I’m so glad I didn’t miss this. Robert, his wife and young daughter stopped by the garden at dusk. They took turns taking each other’s photo as Monarchs. It is very heartening to see the enthusiasm of Garland leaders for our pollinators and urban agriculture. 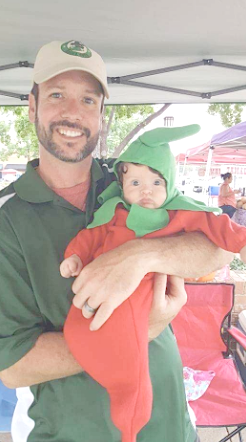 Mr. Smith and his family, like many Garland residents, are urban farmers. Once in a Lifetime Opportunity to Become a Monarch! Send a Photo of Yourself as a Monarch to the Mayor! 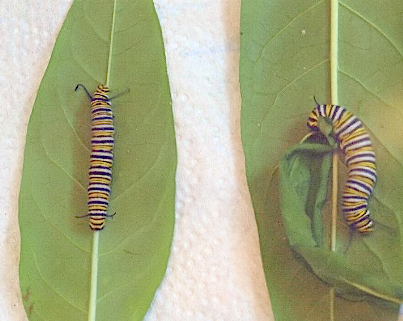 Participate in the “Monarch Post Cards from the Garden” Project! 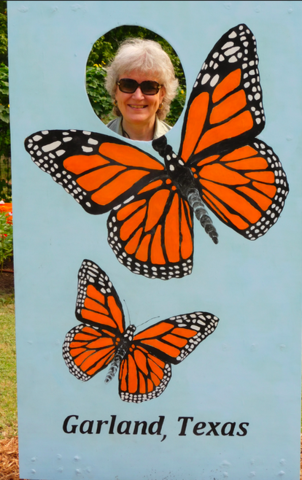 We hope that at least 1,000 Monarch post cards will be sent to Mayor Athas! 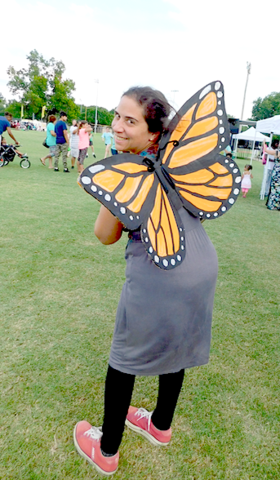 Join the fun as we ramp up for Monarch season in Garland, Texas. Visit the Garland Community Garden at 4022 Naaman School Road in between now and November 1st. You will see our Monarch board in front of the garden. Step right up, stick your head through the hole and have a friend snap your photo with their phone. 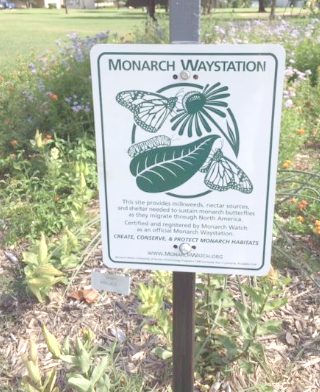 Read the information on the back of the Monarch sign board and learn what the Mayors’ Monarch pledge is; why not only Monarchs, but all pollinators are important. Learn about the importance of establishing habitats for pollinators in your yard. The Sign is installed at the Garland Community Garden! At last! This evening at about 8 PM we completed the Loving Garland Green Monarch face board project by pouring cedar mulch around the base of the sign. 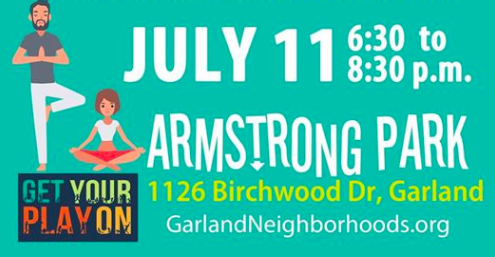 The purpose of this project is to support Mayor Athas in his efforts to raise public awareness in Garland regarding the benefits and responsibilities of building/restoring habitats for pollinators within our urban ecosystem. 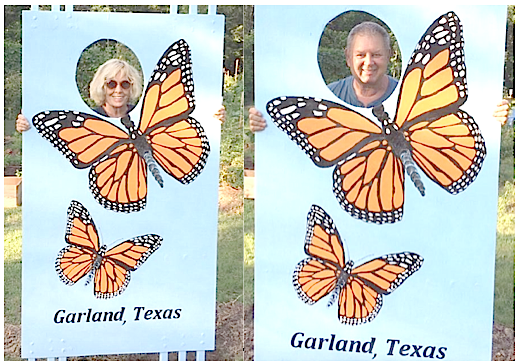 Providing that our sign withstands the Texas weather, it will be in the garden from now until November 1 as this is roughly the time when it is possible to see Monarchs in the Garland Community Garden in the months that remain in 2017. 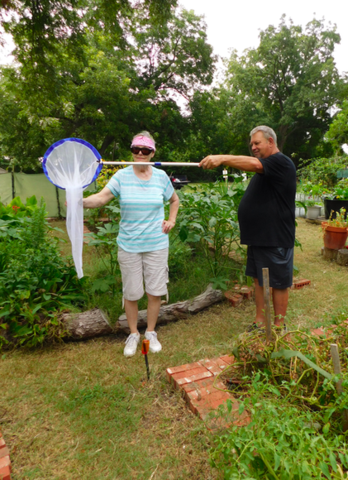 We saw our first Monarch in the garden this year during the first week in April During the last week in April, on April 27, we released 7 Monarchs to the watchful amazement of 69 first graders from Beaver MST, one of our local Garland ISD schools. What does Garland have in common with New York City? Manhattan has their Central Park and the City of Garland has their Central Park. Both are urban parks beloved by their residents. The Central Park located in New York City (which now occupies 843 acres) opened to the public in the winter of 1858. Our Central Park, established 90 years later in 1948 here in Garland, is located on fifty acres of land—a favorable comparison to the New York version when one considers number of residents per acre: NYC has 8,538,000 residents and Garland has 234,943. Thus NYC Central Park has 10,128 residents per acre of its Central Park compared to the maximum potential for only 4,698 residents per acre in the Garland Central Park. In 2013, the Texas Recreation and Park Society designated the City of Garland’s Central Park as a Lone Star Legacy Park. Designation as a Lone Star Legacy Park is the highest honor in Texas that can be bestowed on a park. Central Park was the first municipal park in Garland. It was the location of the City’s first community center and swimming pool. Central Park is also home to the first municipal tennis courts in our city that are still in use today. 101.5 Pounds of Produce so Far from Our Experimental Garden Plot! Way back in April of this year Shannon Lawless, a Senior at North Garland High School and also President of NGHS Environmental Club contacted Loving Garland Green and asked they could work with Loving Garland Green in some way. 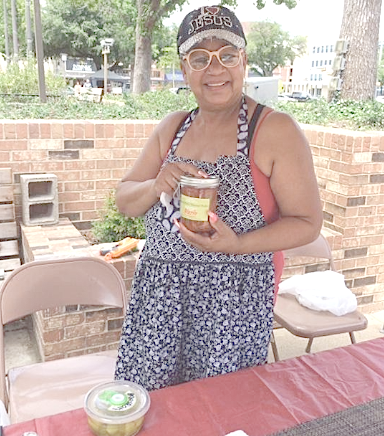 As most of my readers know, the mission of Loving Garland Green is to increase the number of Garland residents who grow some of the food they eat. 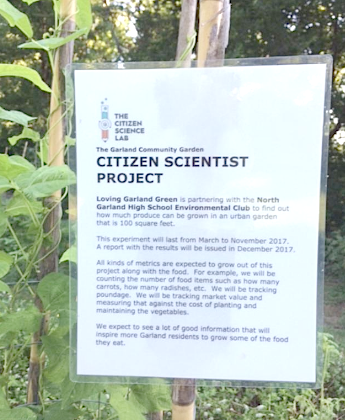 So we designed a Citizen Science Project: The 100 Square Foot Garland Urban Garden. 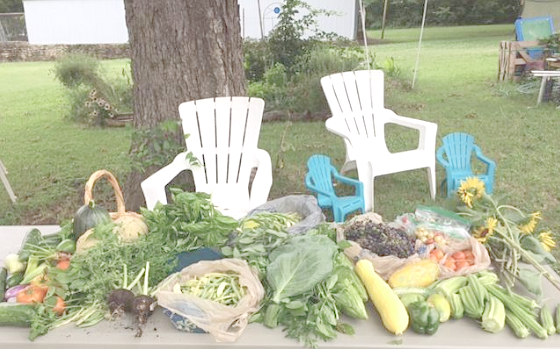 The goal of this project is to see how much produce a resident can grow in a small urban garden from April until the first of November here in Garland, Texas—both total poundage and dollar value. 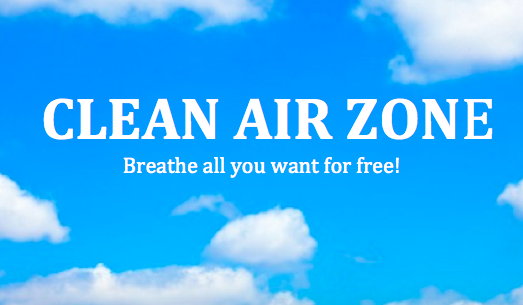 This citizen science project is a team effort between members of Loving Garland Green and the members of the North Garland High School Environmental Club. The students were in charge of this garden plot from April through May. Then from June until the end of the first week in September, members of Loving Garland Green are stewarding this plot. The students will take over in September and carry through with stewardship until the first of November. Jane Stroud, President of Loving Garland Green, has been exemplary in her leadership of this project for our organization. Without fail, Jane has been down to the garden every Monday Wednesday and Friday to harvest and weigh the produce and tend the experimental plot. In addition, Jane (a recently retired microbiologist) is meticulously maintaining a spreadsheet with the statistics related to type of produce harvested, poundage and dollar value. For the NGHS bed Year-To-Date: 101.5 pounds produced at an estimated value of $200 (72.5 pounds of this have been donated to Garland Good Samaritans. 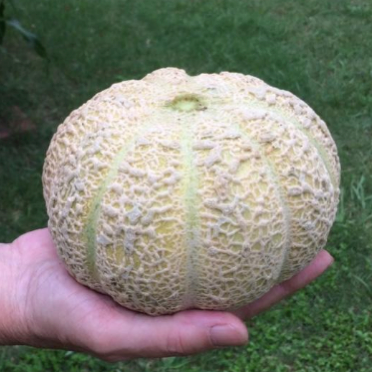 At the end of this Citizen Science Project in November, we will publish a report on this project—the goal of which is to show folks just how much food it is possible to grow in your own yard right here in Garland, Texas. 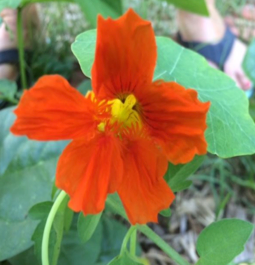 In addition to the Experimental Garden Plot, the Garland Community Garden has been prolifically producing this year. We have harvested 32 pounds of beans from our bean plot. Our tomatoes are about to come into their own as well as our okra patch. Only a few blackberries are left, but to date, of those we weighed, the garden produced 28 pounds of blackberries. At an average price of $5 a pound, that’s $140 in blackberries alone. I’m sure there were more as people often come to the garden and pick and eat blackberries while they are there. I know I do. They are hard to resist. Our members also produce and donate from their home gardens. For example, I know that Gene and Margie Rodgers, founding members of Loving Garland Green have donated 42 pounds of tomatoes and squash to the Garland Good Samaritans. I have donated 9 pounds of figs,15 pounds of grapes, and 13 pounds of carrots from my garden and both Charlie and Jane have donated several pounds of tomatoes each from their gardens to the Garland Good Samaritans. We have a long growing season here in North Texas. You are just in time to start that fall garden. Look on our website www.lovinggarlandgreen.org to see what you can plant now. Come to the downtown Garland Texas Square the first and third Saturday of every month to meet some interesting people with interesting products. What a busy Saturday—not at all what I had in mind when I got up yesterday morning. Sometimes it seems the more extensively I plan, the more serendipitous my path becomes. I had planned to work in the Garland Community Garden all day. The carrot seeds I prepared in neat rows on paper towels the night before were ready to plant in our root beds beside beets that are already planted. My goal was to yank out the remains of a melon vine, the last holdout from spring in the bed where the beets are now planted. Later, around 8 or 9 am when Jane arrived, we were going to lay irrigation pipes in three more of the beds down at the garden. But, unbeknownst to me, the European honeybees had revenge for humans on their minds as someone removed their hive in between 6PM last night and 7:30 AM this morning. As I climbed into the back of the truck at about 7:45 AM on Saturday to get a bag of soil out, about eight honeybees stung me. I jumped down off the truck just as Jane was pulling into the garden. With bees streaming behind me, I ran for her car and jumped in. (I’m lucky she did not lock the doors.) Once inside the safety of her car I could see the bees were swarming all around the garden. We wondered why they were so agitated so we drove to the back where the hive was located and it was gone. Frankly we were shocked, as I can’t imagine the beekeepers removing it without giving us notice. We are looking into it to see what happened to the bees. Regardless, I’m voting to not have the hive replaced. European honeybees in my opinion (and I’m sure I’ll hear about this) are an unnecessary hazard at the garden. We have more than enough native bees and other native pollinators at the garden AND they all, with the exception of the wasp, have much nicer manners. Additionally, unlike the honeybee, the sting of native bees does not cause anaphylaxis shock. Usually it is no more than the sting of a mosquito. If the bees weren’t enough, the rain came—a blessing as it calmed the bees down—at least enough for me to go to the truck, turn it on, crank the air conditioning, and shut the door. I waited in Jane’s car for about 10 minutes for the frigid air in the cab of the truck to put the bees to sleep. It did. I brushed most of them out of the truck—not dead but slumbering. Back home again with my plans shattered, I pondered what to do next. I finished a cartoon for a project I’ll tell you about in another post and took it to Office Depot to be enlarged. Then I came home and painted a plywood board blue. Now what? By now it was 11 AM and I still had three hours before going to downtown Garland to pick up a friend of mine, Becky Browning, who had a booth at the Garland MarketPlace. From 11 to 1:30 today (Saturday) I put up 7 half-pints of fig preserves. For some reason this year the squirrels are letting me have them from my fig tree. A week ago I made several half-pints of pear preserves, which are delicious. This was the first time ever I canned anything. Canning has been on my bucket list for some time. 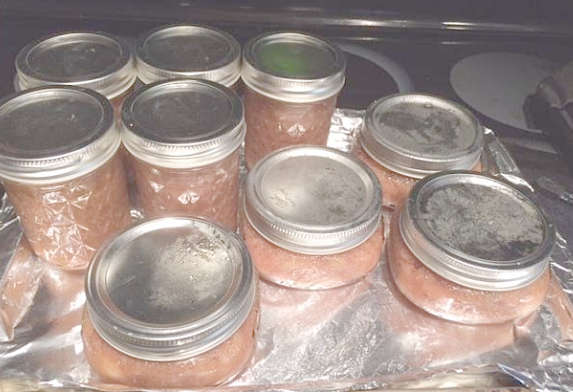 I grew up watching my mom and granny can and always thought of canning as some mysterious hard-to-do project requiring a lot of special equipment, not to mention talent—but it really is easy AND I don’t have to worry about killing anyone with botulism. I get the pears free as fallen fruit that no one wants—thus this jam is quite a bit cheaper than organic jam n the grocery store. Drain pears and put into pot. One cup of sugar or stevia for every three cups of pears. When ready to cook, stir in 1/3 cup lemon juice and ½ cup water. Lightly boil for 2 to 4 hours. During last 15-20 minutes sterilize clean jars and lids in oven at 225 ten minutes. Ladle hot preserves into hot jars filling to within ¼ inch from top. Wipe rim clean with paper towel if necessary. Center lid on jars and apply band until fingertip tight. PROCESS JARS BY BOILING IN ABOUT TWO INCHES OF WATER FOR 10 MINUTES. Check lids 24 hours after cooling. eat it within the month. Downtown to the Garland Square to Pick up Becky and meet the Garland residents and owners of Bubba Funke Jelly. Is Garland becoming the homemade jelly capital of the world or what? 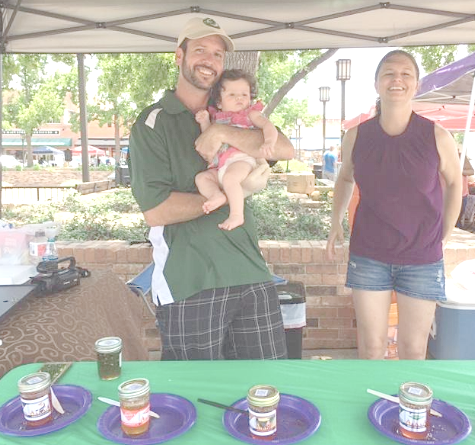 The people right next to my friend Becky’s booth were the Jelly-Making Funkes of Garland Texas—Jelly-making is not the only thing this couple makes. In addition to a beautiful baby daughter, each of the Funkes has other creative careers too. In her other life, Christy Funke is Safari Classics production manager. Overseeing all areas of video production in the Dallas office, her talent as an editor, combined with her creative eye is a driving force behind the success of Safari Classics Productions. Seeing Africa every day through her computer, and having been on safari herself, enable Christy to capture the mood and unforgettable moments of a particular story or safari. Christy is truly one of the top editors and production specialists in the entire world of outdoor production making her a key member of the Safari Classics team. In his other life her husband, Michael Funke, founder and president of Bubba Funke Jelly, is a fifth grade teacher by day. Michael was bitten by the ‘jellogical’ bug several years ago when he was on a quest to find an all-natural, preservative free jalapeno jelly in stores. Not finding any that met his high standards, Michael began to make his own using a recipe from his grandmother and the rest is history. I believe this is their third jelly summer. You can visit their website and order their jellies online too at Bubbafunkejelly.com . Laurie is another local Garland entrepreneur. She hails from Minneapolis—a city where I lived for almost 20 years. 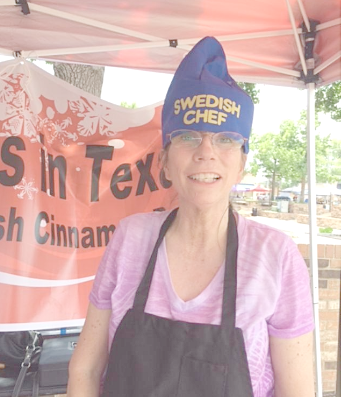 Yes, she is an authentic Swede and the recipe for her Swedish cinnamon buns is an authentic one that came from her grandmother. 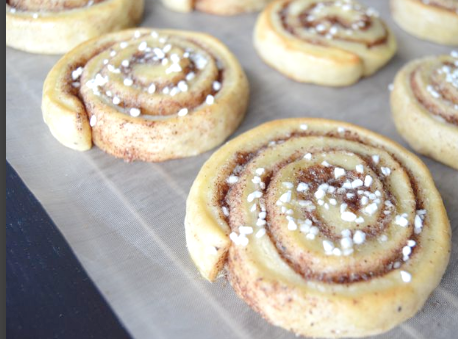 If you’ve ever been to Minneapolis, or lived in Sweden, you’ll know that the Swedish version of the Cinnamon roll is not the same as the big yeasty ones that are often served in the USA. The Swedish version is smaller and flatter but just as yummy! Laurie gave me a sample and Becky and I devoured it on the way home. Laurie makes special orders for parties. OR COME VISIT THE GARLAND MARKETPLACE THE FIRST AND THIRD SATURDAY OF THE MONTH ON THE SQUARE IN GARLAND TEXAS. 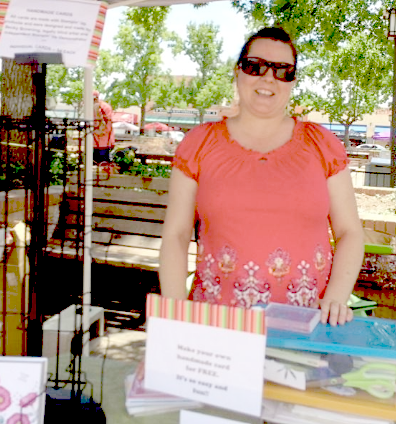 Becky has been an independent Stampin’ Up demonstrator for over two years. Her passion is teaching others how to create their own world by sharing her gifts with others. One of the many ways Becky does this is through her company, Wallflower Greetings. Not only does Becky sell the cards she makes, she also teaches people how to make their own greeting cards for all occasions and encourages them to be creative and take charge. Like the Funkes, Becky too has another life. A graduate of west Texas A&M, Becky works for the Texas Department of Assistive and Rehabilitative Services DARS Center for Learning Management. For a number of years Becky worked directly with clients of this organization teaching those in the process of losing their sight and sight impaired already how to manage their lives in the world of the sighted. Not only does Becky have the education, she also has the experience for her work as she has been sight-impaired since birth—not that you would know it. By example alone, Becky is an inspiration to all. I think Becky is now working in a managerial position at DARS where she teaches others who will then be teaching their clients. In this position Becky travels all over the state to lead training seminars. VISIT SOME OF HER INTERNET SITES! Better yet, meet her in person next month at the Garland MarketPlace down at the Garland Square. Cheryl is another local Garland Entrepreneur, and like many of the other local Garland entrepreneurs I talked with, Cheryl is ready for that next step to broaden her commercial reach within the community. In particular, many people have asked Cheryl if she would offer a class in hand lettering. When you see her work, you’ll know why. Also, like Becky and Mike, Cheryl already teaches others. In Cheryl’s case, she is an art teacher. Cheryl’s passion is making works of art from reclaimed wood and other objects. The wooden cutout of the state of Texas in the photo above is an example of her craft. If you have something in mind that you would like to have created out of reclaimed wood, contact Cheryl@txcraftyginger.com . I’m guessing that she could make it for you. Go to www.txcraftyginger.com and learn more about Cheryl and her art. And of course you can visit her in person at the Garland MarketPlace on the downtown Garland Square. I was thrilled to see Stephanie still in business and going strong. Stephanie hails from an area near FairPark in Dallas. 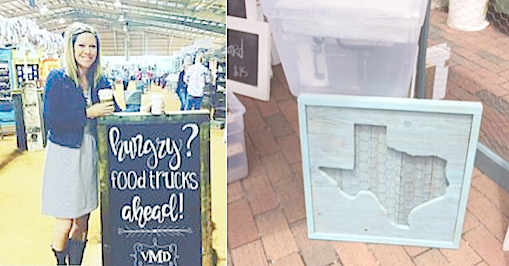 I’ve been blogging about Stephanie at the Garland MarketPlace since 2014. You can visit her products online at www.pic-licious.com. Stephanie pickles anything that is not tied down—from strawberries to cheesecake! Stephanie even has one of our local businesses here in downtown selling her goods—Trims and Treasures on Main Street, right next to Main Street Café. Stop in for a haircut and pick up a jar of Stephanie’s pickles during business hours right here in Garland, Texas. 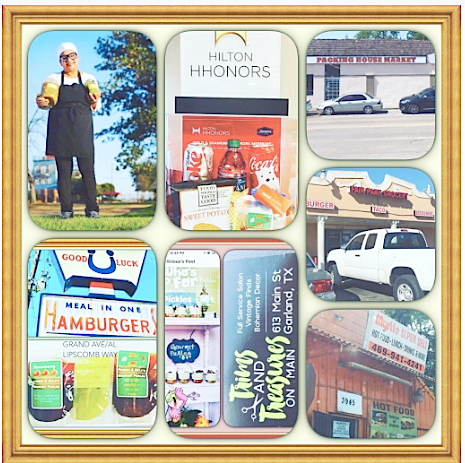 Stephanie sent me this collage of all the businesses that now are selling her delicious pickles. I hope more will join. Call her up at 214-670-2042 and tell her what you would like to have pickled—I’ll bet she can do it as long as it’s not your neighbor’s dog. 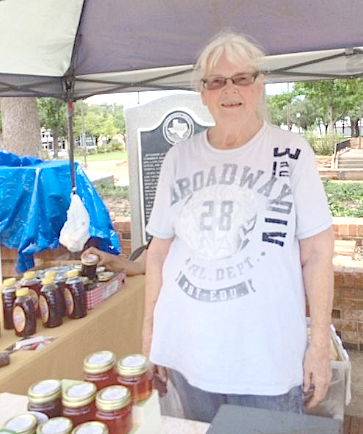 Suanne is another familiar face at the Garland MarketPlace. Suzanne hails from Mesquite. She has been selling her excellent wares here on the square for at least three years. Visit her Facebook for more information about her yummy wares, or write to Suzanne at grannysgourmet@yahoo.com . WANT TO BE ONE OF THE VALUED MARKETPLACE VENDORS? The Garland Community Garden thrives thanks to all the rain we’ve had in June (and even moving into July toward the mid mark of this month too). The following are normally planted beginning in July and August or later for the fall crop. Dates are for seeds unless specified: S=Seed, T=Transplants. Summer heat means spider mite weather. They cause the leaves to mottle with brown spots that eventually dry out and die. There will be small spider webs in nooks and crannies of the plants. Howard Garrett’s contention is spider mites attack only sick plants. Summer heat may stress them enough to make them vulnerable. This is the reason to replace some spring crops with fall crops in July or August. Improper plant hydration is another main cause of vulnerability. Too little watering or over watering where the roots don’t have enough oxygen and rot, both prevent water from moving up into the plant. Squirting spider mites off with a hose may be enough. Don’t spray them off on to something else in your garden though. Howard Garrett says to spray first with garlic/pepper tea and/or Kelp Extract every three days for nine days. Insecticidal soaps would be next thing to try. Plant oils and Citrus oil sprays can be used but only if the other treatments are not adequate. The oils are more likely to harm the plants in the heat if temperatures are over 85 degrees, and affect beneficial insects. Spray in the evening. If these efforts don’t work and the plants are under proper organic care, they may not be the right plants for the conditions. Note: the key to identifying an iron deficiency is that while the leaves are yellow, it will have dark green veins. Summer heat stressed plants will often show an iron deficiency condition called chlorosis. Grass, leaves, and other foliage will turn yellow with darker green veins. The cause is our high pH clay soil that chemically binds iron and magnesium nutrients needed to make chlorophyll for photosynthesis. Treatments include liquid iron chelated foliar sprays (fastest), iron sulfate granules (Copperas), or Greensand soil dressing (slowest). High compost content to the soil will lower the pH and be a more permanent solution. Mix 2-4 inches of compost into bare soil or top dress lawns with a half an inch of compost on a regular bases. Aeration of lawns helps also. BE SURE TO SHOP LOCAL WHENEVER YOU CAN! IT HELPS THEM AND IT HELPS YOUR LOCAL ECONOMY! This eco-conscious garden center carries native plants and organic products such as fertilizer and pet food. Growing some of the food you eat is rewarding from numerous perspectives. Of course, growing some of the food you eat has many benefits in addition to the dollar value of the produce: increased awareness of the value of sustainable living; greater appreciation for healthy eating as you watch your own health improve; opportunity to interact with nature and thus become more aware of your place within the chain of life, etc. Since we are about mid-season of our first growing season here in Garland for 2017, I’ve decided to take a preliminary tally of what Charlie and I have grown in our respective gardens. To do this, I use average per pound retail prices obtained from lists provided by the USDA. My estimates for the net profit from our two urban gardens is a whooping $1,652.60. You don't need the back forty to grow a lot of valuable edibles. Charlie's approximate gardening area for his blackberries and tomatoes is 252 square feet of containers located around the edge of his swimming pool. My approximate gardening area for my blackberries, carrots, grapes and figs is 100 square feet. The blackberries, carrots and grapes have replaced what was once lawn in my front yard. Although I never tried it, I'm certain the produce I'm growing now is far tastier than the grass that grew in its place for over 30 years and no doubt contributed vast amounts of pollution to our groundwater through over fertilization--not to mention pollution to the air from its weekly mowing. So far this year Charlie’s garden has yielded 61 ¾ pounds of vine ripe organic heirloom varieties. The USDA divides fruits and vegetables into three broad categories: nonorganic; organic; and organic specialty. The price increases with each category with organic specialty being the most expensive. Of course the pesticide-laced produce are not only the prettiest, but also are the cheapest. Remember what your mother taught you: “looks can be deceiving.” Charlie’s tomatoes fall into the category of organic specialty and sell at the rate of $3.99 a pound. This puts the value of his tomatoes thus harvested at about $242.40. To get a more accurate picture of profit, one must deduct expense. Charlie’s tomatoes all came from seed and I think he spent about $20 ordering his special seeds from Baker Creek Heirloom Seed Company. He likely spent another $50 in soil amendments. Add another $30 perhaps for City water—although we’ve had a lot of rain this season and Charlie has rain barrels. All in all, for his tomatoes I would say that his expenses to produce them were no more than $100, if that. Thus today Charlie has made $142.40 net profit AND there are still at least 25 pounds of tomatoes ready to be picked within the next three days. Since these are heirloom tomatoes, they will bloom in the fall again and produce about half as much as their first crop. All total I estimate that Charlie will produce about 200 pounds of tomatoes over both of our growing seasons here in Garland. At $3.99 a pound, the dollar value is in the neighborhood of $800.00. At expenses of no more than $200 for both seasons, that puts Charlie’s profitability on his tomatoes roughly at $600.00. We will continue to eat lots of fresh tomatoes and share them with the Garland Good Samaritans. In the fall when it is a little cooler we will cook up and freeze a lot of tomato sauce for pizzas and pasta dishes this winter. Most of the heirloom tomatoes Charlie grows have skins that melt in your mouth. Try to find that quality in a grocery store and you’ll be disappointed. Tomatoes in grocery stores are tomatoes grown from hybrid seed engineered to produce tough skins that can withstand being shipped over 1000 miles to a grocery store shelf. The only distance that home grown tomatoes need to travel is from your garden to your kitchen. This is only the second year for Charlie’s blackberries—all of which came to Charlie free, by way of me. By now I would estimate that over 100 blackberry bushes in Garland have sprung from the four bushes planted in my front yard in 2013. The Garland Community Garden alone has 25 of them and at least as many have been sold at Loving Garland Green plant sales. Thus you can chalk up zero for expenses to grow the blackberries. I think they may have been watered twice so far this year. Organic blackberries .85 an ounce. I have a large fig tree in my backyard that came with my home when I purchased it 10 years ago. To say that this tree thrives on neglect would be an understatement. I’m fairly certain that I have not watered it for the past 4 years. Yet it continues to thrive and produce figs each year. I can certainly say without hesitation that the dollar value from the figs produced at my home is 100% profit. It’s a green fig tree but I’m not certain as to the variety as there are many green fig varieties: garnsey, kadota, St. John, calimyrna, verte, ventura, panache, celestial, and adriatic. The adriatic fig is most often used make fig bars. Green figs are sweeter and I prefer them to both black mission figs and brown turkey figs. Figs are a great source of calcium and dietary fiber as they are rich in antioxidants and when dried they develop even higher percentages of minerals such as copper, magnesium and potassium. 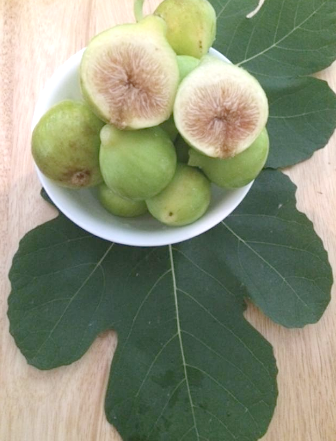 The leaves of the fig tree are also an edible part of the plant but fig leaves are not tasty. Some folks use them to make a tea that is said to lower a diabetic’s need for insulin. As for cooking, the best use of the fig leaf is to use it as a wrap for certain dishes in substitute for other leaves such as cabbage or grape leaves. Don’t look for fresh figs at your local grocery store. Harvested figs have a brief shelf life and should be eaten with a few days of ripening. Furthermore, even if they would not be over-ripe on arrival, special packaging would be needed to insure their safe, un-squashed delivery thus adding more to effectively pricing them out of the market. And that is why the current price for organic figs is $7.00 a pound. To date I have picked 8 and ¾ pounds of figs from my tree at a total dollar value of $57.70. I have at least as many growing to maturity. Thus I anticipate a yield of approximately $125 in dollar value of figs. Cost to me—nothing. I have four grape vines that I planted in my front yard in 2013. They are a red seedless variety developed especially for our hot humid North Texas summers by folks from the University of Arkansas. I need to research my records to remember the exact variety. I know I have it written down somewhere. The grapes are small and delicious. To date for 2017, the vines have produced 22 pounds. 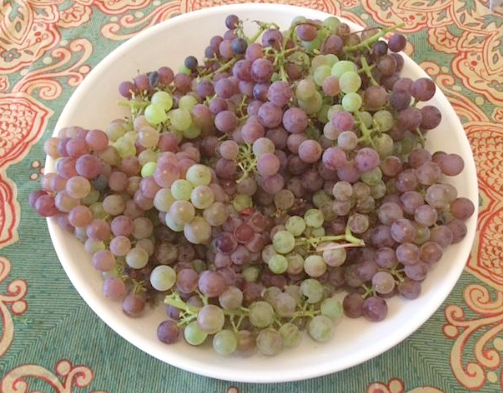 I anticipate about 6 pounds are left on the vines making for a total of 28 pounds of grapes this year. My grape vines are only second to my fig tree in terms of my neglect, but in the case of the grape vines—I planned it that way as I began in 2013 designing the garden (that will eventually replace my entire front lawn) as a forest garden that will largely be self-perpetuating like a forest. It will eventually provide me food with little effort on my part. I’ve patterned my gardening techniques after folks like Ruth Stout and Eric Toensmeier. 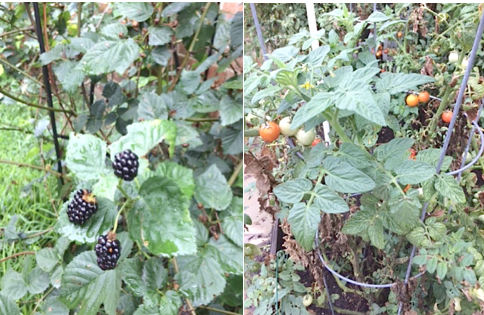 In 2013 I planted four black berry bushes (Apache and Natchez) in my front yard. Blackberries are wonderful and they freeze well. This fruit is chocked full of valuable nutrients and antioxidants. In Garland this plant produces prolifically with little to no care. Just prune the stalks that produced berries at the end of their seaso. I recommend the thornless varieties as they tend to not spread as wildly as the thorny varieties. To date I have harvested 16 pounds from my front two bushes. This is my first year to plant carrots on any scale. I planted several varieties with seed purchased from Baker Creek Heirloom Seed. The seeds had excellent germination results. As a matter of fact, I just planted another crop of about 250 carrots last week. 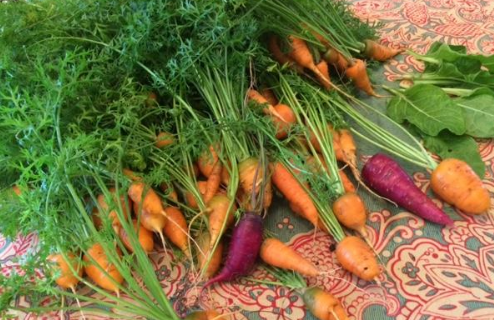 Thus far I’ve harvested 20 pounds of carrots from my front yard. I have at least another 10 pounds to harvest from my first crop. I haven’t even mentioned all the herbs in our gardens. Fresh herbs are very expensive in the store but they do add a depth of flavor to our food—often making the difference between a meal and an experience. I have two large plants of rosemary in my yard along with a clump of lemon grass, a clump of lemon verbena, some mint, curry, oregano and rue. Fresh herbs are among the most expensive items on the grocery store shelves with common herbs like rosemary selling for $4.00 to $7.00 an ounce. Saffron, by far the most expensive herb, sells for between $2,000 and $10,000 a pound. Choose plants that you like to eat and that don’t require a lot of fussing over. For example, it doesn’t make a lot of sense to plant a fig tree or a blackberry bush if you don’t like figs and blackberries, no matter how care-free these two edibles are. Choose a few plants perhaps for others. 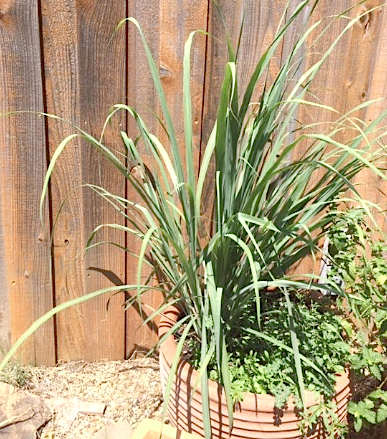 Some edible plants such as lemon grass are pretty to look at and make a good habitat for pollinators. So, even if you don’t like to drink lemon grass tea, you might still want a lemon grass plant. 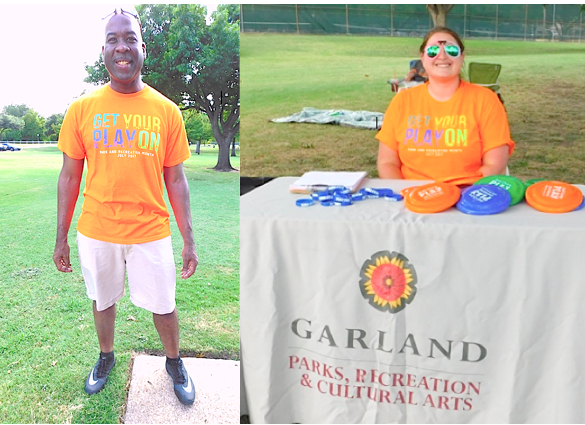 Since we are celebrating National Parks and Recreation Month, and since I’m a member of the Garland Parks and Recreation board, I’ve decided to celebrate by sharing information with you about some of the great parks in my community. While I will try to at least mention all 63 parks, there won’t be enough time to provide you with extensive detail on each one. You will either have to believe me when I tell you that each one is special in its own way—or better yet, you’ll have to visit them all as I did a few summers ago with two of my grandchildren and form your own opinion. Each park has its own special history, personality and attractions. I’ll begin the series with a park located in south Garland. 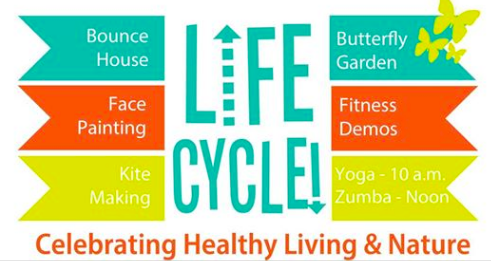 A great park for having fun and improving your own physical fitness! Col. Armstrong grew up in Garland, Texas, attended SMU, and graduated 16th in his class of 564 at West Point. During this tour he was selected to lead the Skyblazers, the USAF Europe's aerial demonstration team, comparable to the Thunderbirds in the United States. He also met and married Margarete Burch. They moved to the US in 1961. An outstanding feature of this park is its signage. I daresay that few parks have such outstanding and educational signage. Frankly, I believe that signage is a critical feature of parks as it can greatly assist visitors in using the area to its fullest extent. Yes, unfortunately, many of us need to be reminded how to have fun. Your children can play while you walk laps around the park. You can bring your family here for a picnic. You can enjoy the beauty of the garden and observe pollinators in action. If you don’t know much about these plants and their pollinator visitors, you can read the beautiful and informative signage about them. If you are an amateur photographer, this is a great place to get those special nature shots. This garden is a great example of volunteerism in action. 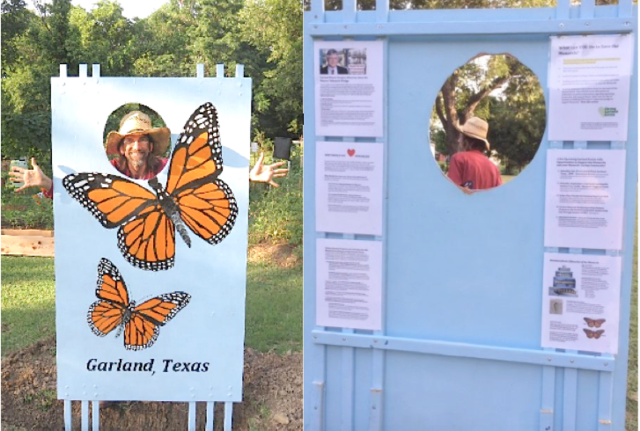 Keep Garland Beautiful spearheaded the installation of this pollinator garden. Our Parks and Recreation Board, our Neighborhood Vitality, and several other local volunteer groups such as Loving Garland Green assisted in the installation. If you walked around the perimeter of this park several times a week, you would definitely notice an improvement in your health. If, when walking around the perimeter of the park several times a week you stopped and followed the instructions found at each of the three exercise stations, you would improve your health even more. In fact, after a few months, your friends might not even recognize you. 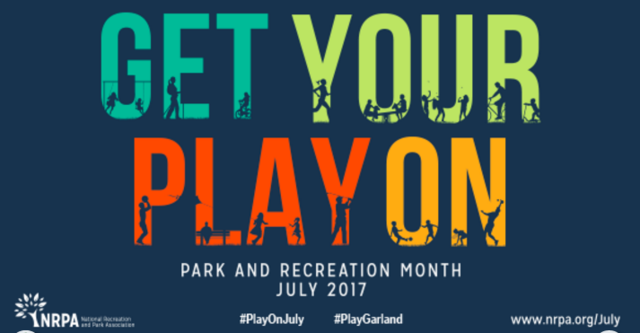 Of course, like all our Garland Parks, our Parks and Recreation Department schedule public events to be held in them throughout the year. The Col. Armstrong Park is no different. Here is an advertisement for one of their events and there is another coming up July 11. As you can see from the map above, the park is a slightly irregular rectangle. I would estimate its size at approximately three acres. Residential streets on three sides access it. Its backside has no street access. Street traffic for the area is pretty much limited to the residents who live around the park. This is truly a neighborhood park. All the mature trees are located near the center of the park, which is where you will also find the picnic tables and playground equipment. The design of this park is ideal for parents or grandparents with young children. 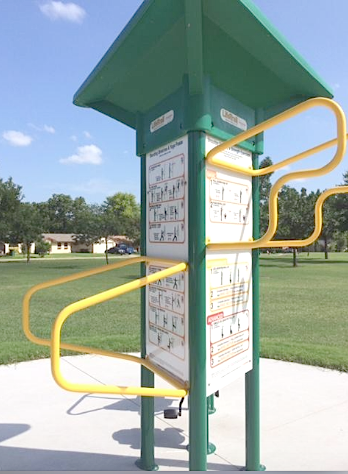 The adults can get their exercise walking or running around the perimeter of the park on the sidewalk, or by using the exercise bars and stationary bicycle at one of the three exercises stations located on the sidewalk path. The children, having their own fun in the playground located in the center of the park, are visible to the adults at all times as they walk or exercise. Because of the central location of the playground there is little worry that a child could dash into the street before being nabbed by the adult. 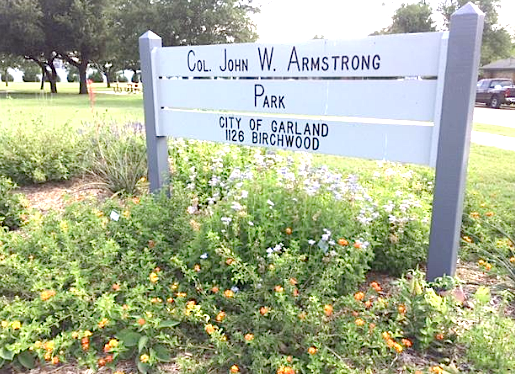 Add to that the very low traffic patterns in this area and I would probably dub the Col. John Armstrong Park as one of the safest in Garland for small children—and thus the most relaxing for their caretakers. This park has one of several and growing number of pollinator gardens located in public areas such as parks and schools of Garland, Texas. Planting was planned and led by Betty Roberts and Reba Collins of Keep Garland Beautiful. 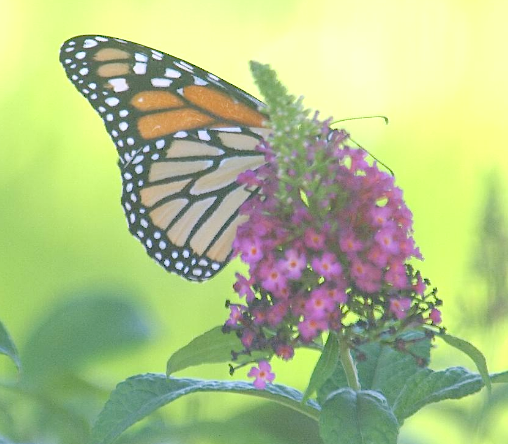 Keep Garland Beautiful applied for and received a small Green Communities Program Grant from Rockwell Collins to purchase native plants and garden material for butterfly gardens in 2016. They used that money in addition to the Rockwell Collins volunteers for the Armstrong Park project. Rockwell Collins is a company with locations in Plano and Grapevine. It was the Rockwell Collins grant program and their great employees who showed up with their elbow grease for digging that made this pollinator garden (also a Monarch Way Station) possible. I brought some asters to install on behalf of Loving Garland Green. Other volunteers from several groups also brought lots of native plants that pollinators love. Looking at the lovely garden today, it is hard to believe that it has been less than a year since this space became a pollinator garden. I just revisited my invitation to this event last year from Keep Garland Beautiful and confirmed that October 29, 2016 from nine to noon was the planting time. Less than a year ago, there was no pollinator garden at the Col. John W. Armstrong Park as the photo below, taken some time in 2016 will attest. 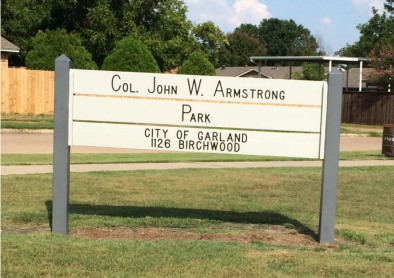 Col. John W. Armstrong Park prior to October 29, 2016. 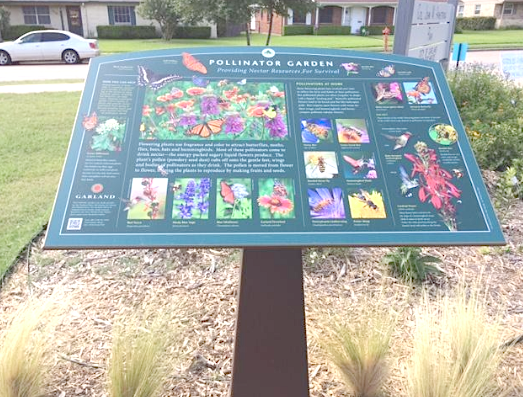 Today, thanks to the leadership of Keep Garland Beautiful, and the generosity of the people at Rockwell Collins, this worthy park not only has a lovely pollinator garden; it also has several beautiful and informative signs that inform visitors regarding pollinators and plants that attract them. When I was there on July 2, 2017 I also observed a pair of Gulf Fritillaries. Pollinator Garden at Col. John W. Armstrong Park –July 2, 2017. You don’t have to try to figure out what to do with those bars. The signage will guide you every step of the way. 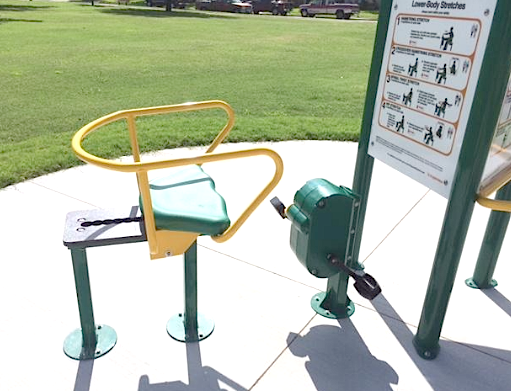 Imagine these exercise stations as exercise trainers who charge no fees. Some might think of this bicycle as the “bicycle to nowhere” as you can sit and pedal all day and you will still be right where you are sitting. However, even if you are still sitting there, your body will be moving on to a better place. Come to the park and try it out. You’ll see what I mean. With this park you don’t even need a personal trainer. Just come to the park, get out of your car and follow the instructions on the signs. Do this for an hour a day, every day for a month, and your friends and family may not recognize you. Parks and gardens are where communities come together. We need them and they need us. Do something this month for a park in your community. Pull a weed, pick up a piece of trash. Call up your local Parks and Recreation Department and ask what you can do. The most outstanding advertisement for any community is the quality of its parks. Most inspirations come us in two ways: 1) through our conversations with others and 2) through reading. Thus it is my theory that the more time we spend talking with others and reading, the more creative we will be. Of course, from time to time we should test our inspired ideas and theories carrying them out as experiments in the real world or writing about them and sharing with others so they can test them out and then report back to us (a concept Bill Gates brought to us). Here are my two inspired ideas for today. The first one came from a site that my dear friend Jane Stroud, President of Loving Garland Green, sent to me. The Bees Waggle. Few activities are more rewarding than teaching a child something about nature and seeing their faces light up with the amazement of discovery that comes with attaining knowledge. Flowers are the messengers for plants that help attract help pollinators. Flowers are critical to our food supply. Unless a plant is pollinated, the flower will just drop off and not produce its fruit or vegetable. [Pollination is the transfer of pollen from the anthers of a flower to the stigma of the same flower or of another flower.] Without pollination and pollinators, we would eventually starve. Flowers contain nectar, a sweet sugar watery treat, and pollen, a yellow powdery protein. Most pollinators seek the nectar, and others will take both the nectar and pollen. Bees use pollen to feed their young and nectar is used as a food for the adult population. Nectar is the food that Monarchs are seeking in the fall when they pass through here on their way to the Mexican highlands. Nectar is the food that gives them the energy to fly thousands of miles to their wintering ground. Flowers Attract Pollinators with color and fragrance. Flowers are very visible because of their color. Pollinators see colors even better than we do as they can see in the Ultraviolet (UV) range. The brightness of the color of the flower tells the pollinators how much nectar the flower has. When the flower color is bright, the pollinator knows the flower has plenty of nectar. When the flower color is dull, the pollinator knows there is not much pollen available. Someone has been there before them gathering it. Unless they are desperate for nectar, they won't even bother to visit that blossom. Flowers also attract pollinators with their fragrance, which is different at different times of the day. We have pollinators who are active at night. Flowers that are pollinated by nocturnal or night time pollinators release more fragrance in the evening as compared to the plants pollinated by daytime pollinators that release more fragrance during the day. Except for the bat that detects smell with its nose, most pollinators detect fragrance with their antennae. How do flowers know how much fragrance to release? Flowers don’t have brains so they rely on an automatic response to sunlight. The ones who want to attract pollinators in the daytime will have a stronger fragrance during the day. The ones who want to attract pollinators at night will have a stronger fragrance at night. 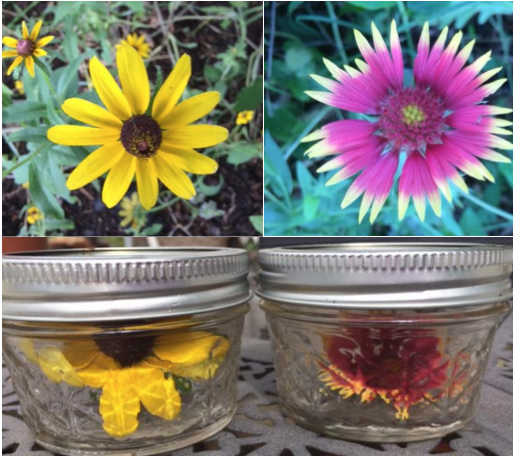 Two wildflowers from the Garland Community Garden picked July 2,2017 and placed in separate jars on Charlie’s patio table. 2. Four petals from two different flowers. If you like, you can put an entire flower in the jar. 1. Put the petals or entire flowers inside the jars (petals from the same flower in same jar—don’t mix petals and flowers in same jar). 2. Put jars in sunlight for about half an hour to an hour. 3. Remove the lid and take a sniff. 4. Put the lid on and then put the jars in a dark place or cover with a black cloth. 5. About three hours later, remove the lid and sniff. Notice any difference? If the fragrance is fainter, then most likely this is a flower that attracts daytime pollinators and loves the sun. If the fragrance is stronger, then it is likely this flower is attractive to nocturnal pollinators such as moths and bats. Note: Gardens should have a good mix of flowers for pollinators with some for the daytime pollinators and some for the nocturnal pollinators. Many of our nighttime pollinators belong to the moth family. They like native night bloomers such as evening primroses, yuccas, phlox, datura and evening snow. Inspiration for my own adaptation of this lesson came from thebeeswaggle.com – a wonderful place to go for more ideas on how to interact with your children or grandchildren and pollinators. We can’t see things in the UV spectrum, but pollinators can. See color through the eyes of a pollinator. Maybe you already have UV lens on your cameras? I don't know. Basically, you take a piece of cardboard paint one side of it black with a magic marker. Then roll the cardboard into a cylinder with the black part on the inside. Fit around your lens and tape in place. Cut the tube just to the end of the lens. Stick a black light bulb in the end and tape it in place. At the least, it is more attractive! A sign I designed that I plan to create and give to Pam at Good Sams before the end of July. It might be that Loving Garland Green could sell these signs for a fundraiser. Who knows? Perhaps we might partner with another nonprofit or even a local print shop in these efforts. On my way home the vision shown in my illustration above came to me. Being the busy squirrel that I am, the inspiration got shoveled not to my back burner, but entirely out of my busy kitchen. Then today when Charlie and I were watering the plants at Good Samaritans, I saw the sign again and was reminded of my idea for a replacement sign. 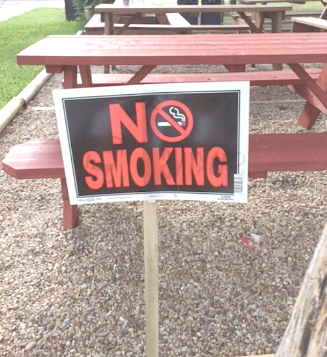 No Smoking sign currently posted at the Garland Good Samaritans in their picnic area. That’s another thing about ideas. Good ideas tend to be persistent and return to your mind again and again. When this happens, act on them—or at least initiate a proof of concept test.